Sen. John McCain is expected to meet with the Dalai Lama Friday. 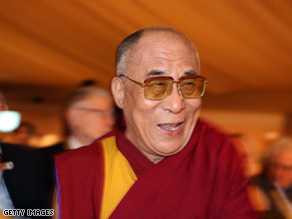 (CNN)—Presumptive Republican nominee John McCain is set to meet with the Dalai Lama Friday in Colorado. The Tibetan political and spiritual leader will be a keynote speaker at a three-day seminar at the Aspen Institute as part of a greater celebration of Tibetan Culture where he will also meet with McCain. McCain is expected to speak at the American GI Convention in Denver Friday morning, and will make the trip to Aspen to meet with the Dalai Lama later in the afternoon. Often referred to as “His Holiness,” the Dalai Lama has lived in exile in Dharamsala, India since the Chinese occupied Tibet in 1959. In April, McCain urged China to engage the spiritual leader in discussions on the future of Tibet. You bet our relationship with China is important......... we OWE CHINA A LOT OF MONEY, SINCE A GOOD PORTION OF THE $10 TRILLION IN NATIONAL DEBT IS OWED TO THE CHINESE! That means, that the United States of America, a beacon of hope and freedom......... will stand silently by as Tibet continues ENSLAVED by the Chinese! Sure we went into Iraq, according to Bush/Cheney/McCain to "bring freedom and democracy" .......but we will turn a blind eye when the Chinese cruelly keep the people of Tibet enslaved! mind our own business, focus on the thing worthful! it's a true shame ! Obama always follow Mccain's lead. Now that Mccain has decided to visit with the Dalai Lama, I'm certain Obama will book the Vantican so he can make a speech in front of the Pope. What a showman he is......silly wabbitbama, tricks are for kids! No, I don't think Obama need to follow that lead nor do I think he will. McCain can have him all to himself. The Dali Lama is a man of peace. CNN why is mccain meeting with him? What is prez bush saying about this? I AM VERY GALD THAT THE DALAI LAME IS GOING TO MEET WITH MC CAIN. HOPEFULLY THE DALAI CAN GIVE HIM SOUND ADVISE. HOPEFULLY HE WILL TAKE TO HEART. WIll someone please ask McCain why I should vote for him intead of Bob Barr? Seriously, McCain isnt even talking about his own policies. Conservatives unite for Barr! Two great men that are interested in serving the world and not their egos. A man of war meeting with a man of peace. McCain is mean, bitter, and jealous! When I read these comments I am amazed at the lack of informed thought and reason that goes into so many of the comments. If these truly reflect the basis for casting a vote then it really does explain how W was elected twice.